Customer Dave Johnston discovers Custom T-Shirt Printing is an Easy Money Maker! These days everyone seems to be looking for a way to make some extra money. I wanted to share my easy money making idea in hopes it will help someone else. My idea is to make custom printed T-shirts: plain, inexpensive, T-Shirts with a humorous, creative, or in my case, a political campaign support spin. Did you know that the Happy Face T-shirt was a billion dollar idea? Did you know that custom T-Shirts bring in billions of dollars every year? I know because I looked it all up before I started my little side business. And now you know, too. I think as myself as someone who is decently creative, so I figured out how to put that creative side to use and make some extra cash each month. The idea came into my head during the 2016 election. 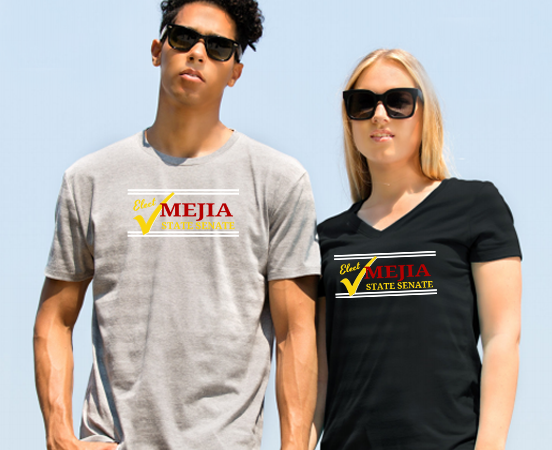 There was so much passion for candidates that fall that I thought there was a good change I could make some money off that passion by creating campaign shirts. My goal was to make a few extra bucks. So, I went onto the online design tool on Broken Arrow Wear’s website and made a few custom T-shirts to support my candidate of choice. I had ten political campaign shirts printed, and as soon as they arrived a few days later, I posted them on Facebook. Well my ten political campaign shirts sold out instantly. In fact, my campaign T-shirts sold so fast that I had to order 30 more that same day to fulfill the orders. Then I made more T-shirts for other candidates. I sold more T-shirts. All I had to do was order the T-shirts from Broken Arrow and then I shipped them to my customers. My little idea quickly turned into an extra $800 a month. While that wasn’t enough to quit my day job, it was enough to enjoy a little extra spending money. All it takes is 15 minutes on a T-shirt design tool to write a few words and put a picture on a t-shirt. Come up with a creative idea (maybe you already have one) and put it on a shirt. Have them printed by a quality T-Shirt printing company like Broken Arrow. In election years, political campaign shirts are an easy way to make some extra bucks. Place an ad on Facebook or else set up a booth at an event and sell the shirts at a price that’s still decent, but for several dollars more than what you bought them for. Be willing to make political campaign shirts that you don’t agree with. Remember that even the competition’s money spends as well as the people you support. My best selling shirt actually supported someone who I didn’t. Finally, find a good partner to work with. I personally really like working with Broken Arrow for all my T-shirt printing. It takes only a few minutes to make a shirt on their online design tool. And the time from creating my shirts to receiving them is only a few days. The team there is also very helpful. They pointed out to me (BEFORE they printed it) that one of my designs had a trademarked picture on it. I was able to replace the photo with on non-trademarked image and save myself a lot of headaches. They even directly shipped a few shirts to customers for me when I didn’t have time to do it myself. Also, since I have worked with them enough, I am now getting a discount, which helps make me more money! So give it a try, maybe you will make the next billion-dollar T-shirt idea!